I would like to suggest that we explore ways to accept greater responsibility for our reactions, emotions, upsets, judgments, limiting beliefs, and a lot, if not everything, that happens to us. Accepting personal responsibility for all that is happening in our lives acknowledges that we are co-creating our lives and our world. 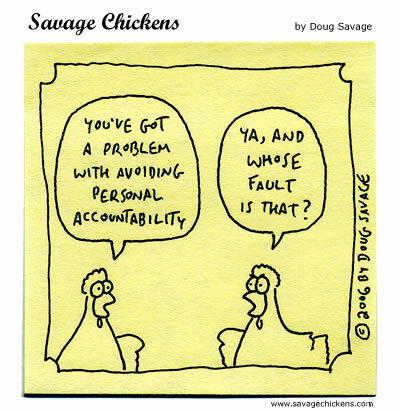 At first it may seem like we're taking too much 'blame', but that's not what it's about. It's about taking dominion over our lives and not blaming ourselves or anyone else for what is happening. Our every thought and action is co-creating our lives and our experience and our world. It therefore behooves us to be more conscious about our thoughts, choices, beliefs, actions, and so on. Look at both the inner and outer choices you are presently making which tend to maintain the situation as it is. "Are there any choices, either inner or outer, that you are making that tend to perpetuate this situation?"